Employee turnover is a fundamental part of any business. Every month new employees join and resign the company. Moreover, if the organization using G Suite plan, then it is the responsibility of admin to remove those employee accounts who is no longer part of the company. By this, organizations will receive the annual license fee. But, the major problem faced by the organization is in deleting G Suite account without losing any information. Therefore, in this post, we are going to show the relevant procedure that used to follow before removing a user from G Suite domain & some staff transition checklist that an admin must perform. 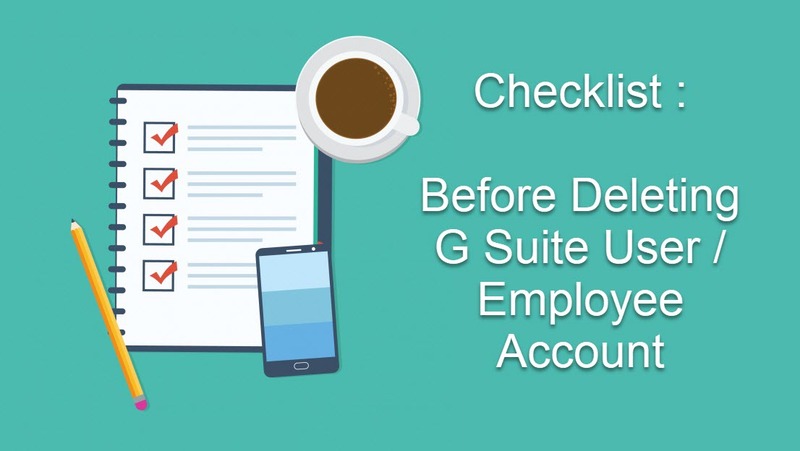 In this section, we have described the top 10 staff transition checklist that are important to follow before you delete G Suite user or Employee account. This can be easily done by the Control Panel using Users & Organization Tab. Once the password change successfully, just make sure to click on Reset Sign-In Cookies to finish the logged-in sessions. Before deleting G suite account, it is mandatory to create an offline backup file of the user account. The will safeguard all the emails, contacts and important folders data on the local hard-drive. This process can be easily done by the Gmail Backup Tool. This software is designed to export Gmail emails. You can also save complete G Suite account mailbox data in PST format on a local hard-drive. It takes some time to go through the entire mailbox data. So, in the meantime, give the responsibilities of departing account to the other employee for a few days. The person who takes care the account that is going to be deleted entitled as Executor. Most of the cases, the admin becomes the Executor. Furthermore, the executor has permission to access and share the data files from the departing user account. The domain admin can select the vacation auto-responder option in the departing employee G Suite account. This feature informs the recipients that user is not available in the office. Whenever any recipient sends the message to departing account, it replies back with the email that you set-up. In this mail, admin can mention the relevant address that will handle the future queries. Make sure that auto-responder notification is Turn On for both the inside or outside recipients. When an employee leaves the company, the admin is able to move the data files to someone else in the organization. By this, G Suite administrator protects the crucial date before deleting G Suite account. This blog suggested to store the files in Team Drives. It is responsible to store all the documents in a collective manner. In such an instance, when the person left the organization, then other members of Team Drives can access the files. Delete the Gsuite user account does not mean that it will not receive emails from the outside world. Due to the presence of domain, messages can be sent by the client to the departing account. To handle this situation, create a group and add some relevant recipient including Executor. So, all the received emails will be routed to the suitable recipient. Deleting the account immediately is not a good idea. It is better to maintain the account for few months. With the help of this, the organization has sufficient amount of time to go through the entire mailbox data. After that admin can delete G suite User / Employee account. Just like giving ownership of files in Google Apps, in a similar manner, admin can share the contacts of the deleted account. It can be easily done by the G Suite Directory. Once the admin adds the departing account contacts in global directory, it displays to the people who are working in the organization. The G Suite admin has the power to enable and disable the global Directory. When admin adds the account in G Suite, it becomes the member of many other services of Google Apps. The non-core applications are Feedburner and many more. Once the admin delete G Suite user account, the non-core account will be automatically removed. So, before deleting an account, make sure that you copy all the crucial data from the non-core account. Moreover, you can also follow the similar procedure for G Suite Marketplace products. By this, no single important information is lost from the domain. Once all the above steps have done successfully, then remove the user from the G Suite domain. Before deleting the account make sure that you have the local copy of the departing account profile. In this post, we have described some staff transition checklist that keeps the data in G Suite domain when an employee leaves the company. Just follow the above-mentioned steps to take care the crucial information left behind before deleting G Suite Account of User or Employee.